Community forests are a part of the solution to the complex challenges now facing B.C.’s forest sector and the province as a whole. Community forestry creates real incentives to manage forests sustainably. By integrating economic, social, and ecological sustainability, community forests promote local livelihoods, encourage community participation, and foster long-term environmental stewardship. A trade show for community forests, Finding the Fit – Exploration of Digital Technology for Community Forests, will be held May 23 and 24 in Smithers, B.C. The show, being held at the Hudson Bay Lodge in Smithers, will include exhibitors as well as demonstrations, and is being organized by the BC Community Forest Association (BCCFA) in conjunction with their annual conference and AGM. The show is timely, as community forest organizations are looking for access to new and appropriately scaled digital technology to streamline their tenure administration, and improve productivity in both the office and in the field. With an average AAC of 23,000 cubic metres, the 58 B.C. community based organizations know that they must create efficiencies to realize their full potential as vibrant, local, small business engines. John Deere is offering loggers a new way to boost productivity with the introduction of the optional U7 heavy-duty undercarriage for its 753JH tracked harvester. By providing increased tractive effort and stability in rugged terrain, this new option adds to the 753JH’s ability to get more work done quickly. The U7 heavy-duty undercarriage is 11” longer and 5,000 lbs heavier than the 753JH’s standard undercarriage, which creates a larger footprint that further enhances stability for climbing or cutting in rugged terrain. The U7 undercarriage also delivers 13 per cent more tractive effort than the standard U6 undercarriage. This enhancement allows the harvester to work more quickly because it can reach farther without repositioning, which enables the operator to cut more from one position. The larger, heavier undercarriage also features larger components for increased durability. Service access to the rollers is also easier, based on a new design that places them closer to the ends, rather than the centre, of the undercarriage. Hultdins has developed a compact chain grease pump for use with Envirosys grease lubricant. This pump can be mounted anywhere on the attachment in a suitable location. The grease pump is activated hydraulically off the existing saw system. 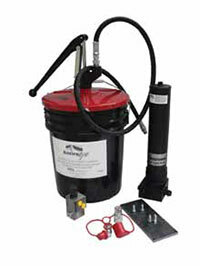 The Hultdins start-up kit includes the chain grease pump, a 17 kg. container of Envirosys grease, a transfer pump, and a drain valve. Comact Equipment Inc. has announced that it has acquired the assets of Groupe PHL. “The acquisition of Groupe PHL is strategic for Comact as it will allow us to complete our product offering, particularly in hardwood sawmill equipment, and will give us additional production capacity,” said Comact President Pierre Morency. Groupe PHL, located in Saint-Éphrem de Beauce, Quebec, is a significant sawmill equipment manufacturer which has offered turnkey solutions to its sawmill, planing mill and wood handling customers for over 35 years. Comact intends to continue the development and sale of PHL products through a new subsidiary, PHL Equipment, Inc. This new entity will benefit from Comact’s international sales network and reputation, as well as from the solid financial backing of its parent company, says Morency. Comact Equipment, Inc., with over 350 employees working from its divisions in Boisbriand, Quebec City, Saguenay, St-Georges, Prince George, B.C. 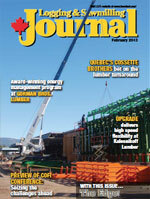 and Hot Springs, AR, is a leader in the design and manufacturing of sawmill equipment. Hydromec has been appointed as the newest addition to Sennebogen’s growing distributor network. It will represent the Sennebogen green line in Northern Quebec from its two locations in Dolbeau-Mistassini and Chicoutimi. 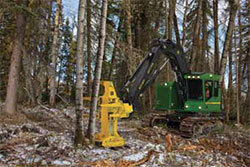 Hydromec is a family-owned company specializing in service and repair, primarily for hydraulic and mechanic components that go into forestry machines. Hydromec became a Ponsse dealer a few years ago and company president Jean Trottier says they started looking for a complementary product line to develop the company’s distribution across the territories it covers in Quebec. BigSteelbox, a Canadian moving and storage company using steel shipping containers, is launching BigSteelBox Structures, a new service offering steel containers modified into living quarters, offices, labs and offices for construction and industrial sites in remote areas across the country. They come with their own bathroom, wood cabinets, massive mirrors and electronic sound system. BigSteelBoxes are 6’ to 53’ containers made of eight-gauge, ISO certified, ship-worthy steel. The new Structures division will be focused on larger scale projects and creating a product line for applications including offices, guard shacks and mobile labs. The living quarter is one 40’ BigSteelBox modified into two separate spaces, each with a private bathroom, built-in cabinets and wardrobe, wall-mounted media hub, 32” swivel TV and extra long single bed. Finnish forestry equipment manufacturer Logset now offers a new product, its THXtender preparation kit, an excavator preparation kit for transforming an excavator into a harvester. The kit consists of the company’s harvester head, an extender boom with bucket and the TOC-MD measuring device. The THXtender makes an excavator harvester more versatile and complete. 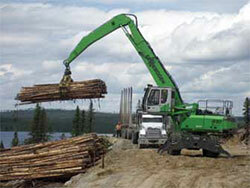 The bucket at the end of the THXtender boom improves the maneuverability of the excavator. The bucket can be used for smaller earthmoving tasks, such as moving stones and leveling the terrain, or for support when making a sharp turn or to cross a ditch. The boom provides almost three metres longer reach. Its TOC-MD measuring device continuously optimizes bucking and cutting functions. Samuel Strapping Systems, a leading supplier of industrial packaging and shipping solutions, recently partnered with Richmond Plywood to improve the plywood company’s product stenciling equipment. Under the old system, an operator would have to manually place a stencil on the load, paint it, remove the stencil, and repeat the cycle several more times to completely apply the required product markings. Not only was it time consuming and repetitive work, but it also resulted in inconsistent quality. Samuel Strapping Systems’ Coding & Labeling Division looked at Richmond Plywood’s needs and offered an automated two-color package stencil system with a custom-sized print window and software controls tailored to meet their exact needs. The Samuel Automated Stencil System was designed to print the same size stencil as Richmond Plywood’s previous system—which was key for the marketing department—while speeding up the rate of application to keep up with the panel trim saw line’s increased capacity. In 2010, RMT Equipment introduced North America to the XW family of wireless crane scales and grapple scales developed by Intermercato AB of Sweden. The company recently completed an installation at a Norbord OSB mill. Mill management wanted a better idea of the total wood fibre weights that their Tanguay PO460 crane loaded into the plant’s flaker mill per shift. Norbord was looking for a solution where it could record precise weights on the grapple without slowing down the loading process. The proposed solution was the new Intermercato XW Series grapple scale. Installing the grapple scale required no downtime with two of the PO460 cranes on site. The RMT Equipment technician completed the actual installation in five hours. The XW Series scale is based on load cell technology that responds to load stresses quickly and accurately. Each unit includes a weigh link and a handheld remote console that receives load data wirelessly from the weigh link’s load cell. 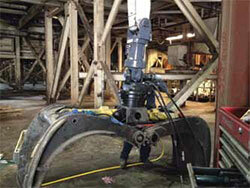 The weigh link is installed by simply replacing the standard attachment link on the crane. Norbord says it is pleased with the accuracy of the RMT scale. New DayLube high performance grease uses nanoceramic particles, which act as sub-microscopic ball bearings, to provide continuous lubrication to steel surfaces found on heavy equipment like loaders, dozers, haul trucks, excavators, and skidders. With a much lower coefficient of friction at all temperatures than traditional PTFE greases, chemically inert DAYLube is also environmentally friendly. It maintains its viscosity across the full temperature range and does not soften or run out; after 100,000 production strokes, it shows no evidence of breaking down, says the company. Extraordinary adhesion extends production up to 10-times that of other greases, says the company. 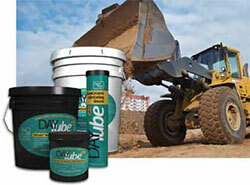 DAYLube operates in temperature ranges from -40°F to 800°F, and the nanoceramic particles remain intact to 2500°F. It survived the ASTME 4-ball weld test with no weld and minimal damage to all ball bearings. Hyster Company has rolled out a new environmental package that extends the range and capabilities of Hyster electric lift trucks into applications that in the past have only been serviced by internal combustion powered trucks. 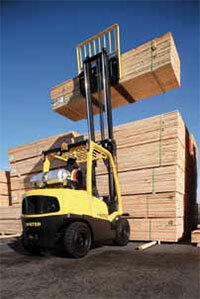 The environmental package prepares electric trucks to handle heavy-duty industries such as forestry. The package comes with three tiered options: the IP54 sealed drive axle and motors with belly pan and side shields, the outdoor protection and wash-down package and the front mud guards. The first option provides shielding devices on the sealed drive axle to prevent debris from interfering with operations. The second features sealed bearings and waterproof cover relays and connectors to make the truck able to work, rain or shine. Finally, front mud guards on the front fenders protect the attachment and load from drive tire debris and water.